The desire to be in the know and ability to utilize all the necessary information 24/7 are among the dominant success drivers for a contemporary person. Numerous IT breakthroughs have provoked an ever increasing digitalization of our lifestyles. Mobile devices and applications have become a significant factor in this trend. Mobile applications (or apps for short) are software applications, designed to run on smartphones, like iPhone, BlackBerry, Android and Windows Mobile phones, as well as tablets, like iPad. Apps for mobile platforms are enjoying great popularity, and the scope of their use is rapidly expanding. Originally implemented for E"mails, calendars and contact databases, mobile apps are now widely used for mobile games, factory automation, banking, location"based services, social media, online shopping, order tracking systems, ticket purchases, etc. Mobile banking apps, for example, allow users to perform numerous transactions, as well as to search for nearby ATMs. An airline app may offer a convenient booking procedure with the possibility to generate a boarding pass and automatically store it within the app. An app from a retail chain may enable users to locate a store, browse the stock, and make mobile purchases. Mobile apps reinforce the brand. They allow businesses to leverage IT"technologies and facilitate customers to more effectively use products and services. Really effective and helpful apps increase information sharing via social networks and promote customer loyalty, which leads to the creation of a strong brand. Mobile apps offer additional value. 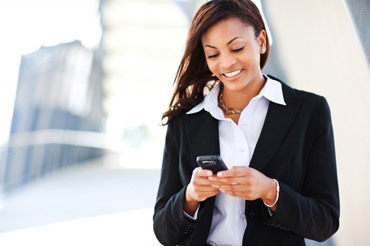 Applications for mobile devices are convenient, easy to install and to launch. They cut down on the time to get and to process the necessary data. This is especially valued by people, who are most of the time on the go. It is often critical for them to have important data right at finger tips, which turns an effective mobile app into a necessity. Mobile apps generate extra profit. A company can, for example, deploy and manage dynamic mobile sales, service and support applications. These solutions are designed to increase the volume of revenue by either simplifying the buying process for existing customers or offering some attractive bonuses to prospective ones. From a user's perspective, mobile apps should be user friendly, save time and money, as well as bring satisfaction. Therefore, numerous businesses, always hungry for better ways on how to achieve higher results and outperform competitors, already consider mobile apps as an essential component of their marketing and social media strategies. Finally, in today's digital era the merits of companies' presence on mobile platforms directly influence their overall success and stimulate future development.